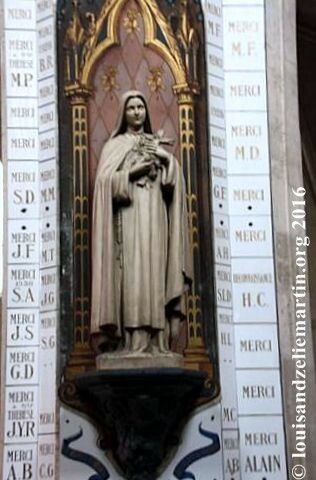 The statue of St. Therese is located at the third pillar. Underneath it is a small altar where people come each day to pray for her intecession and to light candles. The statue of St. Therese, surrounded by « ex votos » (plaques in thanksgiving for favors received through her intercession) is displayed above a plaque commemorating her father’s baptism in this church. 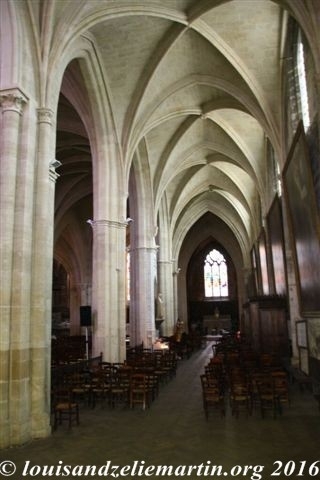 « In this church, on October 28, 1823, was baptized Louis Stanislas Martin, father of St. Therese of the Child Jesus. » Note that Louis was baptized « Louis Joseph Stanislas, » but the « Joseph » was omitted here. "I want to spend my heaven in doing good on earth." On either side of the reliquary lies a golden rose. These two golden roses, the gift of Mme. Marie Therese B. d'A . 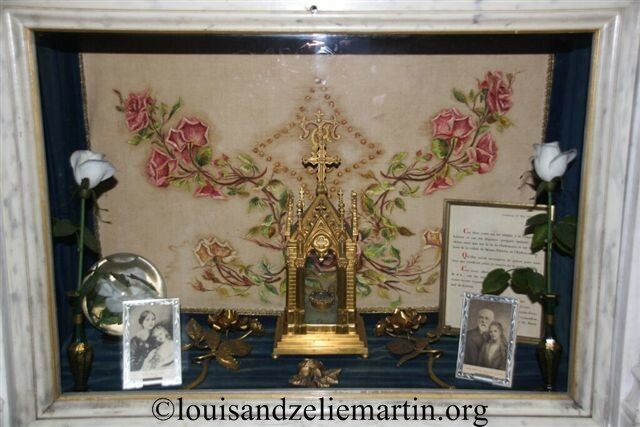 . . , were blessed in the chapel of the Carmel of Lisieux and placed for a few moments on the tomb of St. Therese, on her sickbed in the infirmary, and on the straw mattress in her cell. They were sent to Monsieur Lacroix, the pastor of St. Eulalie's, by St. Therese's four surviving sisters on March 10, 1935. This reliquary contains a precious fragment of the flesh of St. Therese, given to St. Eulalie's Church by her four surviving sisters in March 1935.
states that they are messengers of the graces that are available to those who come here to pray near St. Therese. The baptismal and religious names of the four surviving sisters of St. Therese are listed. This article is part five of a series about the birth and baptism of St. Louis Martin in Bordeaux. Continue to part six, "The reliquary of Sts. Louis and Zelie Martin in St. Eulalie's Church, Bordeaux." All photographs are the gift of Yves and Lai Ping Cogoluegnes Kong.